It can be hard to compare outdoor fans and decide which is the best for your needs because fan manufacturers and sellers aren't consistent with the information they give you. You might find some information on one fan and completely different information on another. Some manufacturers will give you "CFM" or "CMM," which is a measure of the fan's air flow. If you know how much air flow a fan makes, you can get a general idea of whether it will meet your cooling needs. We go into that on our fan air flow page. Some manufacturers tell you about the fan's motor and energy use. While this won't tell you anything about air flow, it will give you an idea of the fan's power and cooling potential. 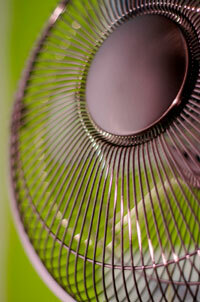 A fan's energy use may be described by Amps/Volts/Watts, BTUs or Horsepower. We touch on each of those here. A motor by itself won't tell you how how much air a fan can move. But it can tell you something about how much energy it uses. There are many kinds of motors used for outdoor fans. There is no industry standard for naming motors, so designations vary widely between manufacturers. Each may have their own descriptions that relate only to their own fans, which won't be helpful for any kind of comparison. They may describe them simply by electricity source (alternating current or direct current), voltage needed, amps and wattage used, or by horsepower or BTUs. Some manufacturers will refer to their motors by size: "188x25" or "200mmx20mm". These numbers usually refers to the physical size of the motor's frame. Generally larger motors are more powerful. But some smaller motors can be more powerful than larger motors, depending on design differences between the motors. CFM, wattage and efficiency can confirm the power of any sized motor. Almost all small outdoor fans and other common household appliances are powered by single phase motors. But as a fan gets more powerful it will more likely be powered by a 3-phase motor. In fact, most motors larger than 10 HP / 750 W / 25,000 BTU use a 3-phase system. 3-phase systems can power these larger motors more economically than a similar single-phase system. 3-phase motors can also vibrate less and last longer than similar single-phase motors. Make sure these larger motors can work with your electrical supply. Some 3-phase fans can operate on more than one voltage supply, making them very versatile as well as powerful. A fan's efficiency rating tells you how much power a motor puts out compared to how much electricity it uses. To be most efficient, standard electric motors work below their "capacity" (highest ability) -- usually about 75%. This allows for up to 25% of the electricity to be lost to heat and friction ("waste-heat") naturally created by electric motors. A motor’s efficiency tends to decrease dramatically below about 50%, so look for ratings above 50%. Outdoor fans with higher efficiency ratings may be more expensive to purchase, but may be less expensive in the long run. Higher ratings mean less energy is lost to waste-heat. That means they use less electricity for the same results as lower rated motors. And more efficient fans typically last longer. For example a 1 HP / 2,544 BTU / 746-watt fan with a 50% efficiency rating at 230 VAC will draw about 6.4 amps compared to about 4 amps for a motor with a 70% rating. Some extremely efficient outdoor fan motors may be rated as high as 98%! You can determine an outdoor fan's efficiency if you know its CFM rating and its wattage. Simply divide the CFM rating by its wattage. If a fan uses 85 watts to move 6,800 CFM, its energy efficiency is 80%. The efficiency rating may be different for different fan speeds. Keep in mind the range of efficiency varies with individual motors. The efficiency of larger motors tends to extend over a broader range than smaller motors. Another way they may describe the motor is by its enclosure. A motor's enclosure contains the working parts of the motor. The kind of enclosure is a big factor in whether the fan is rated safe for dry, damp, or wet environments. You can learn more about safety ratings on our Electrical Safety Outdoors page. ODP (open, drip proof) and TEFC (totally enclosed, fan-cooled) enclosures: for indoor use only. TENV (totally enclosed, nonvented): good for use in damp, not wet areas and indoor / outdoor use. WDN (washdown): use where the motor may often get wet; an excellent enclosure for any kind of outdoor use. XPRF (explosion-proof): safe for use even in hazardous locations; they are a fine choice for any kind of outdoor use, but are the most expensive. Outdoor fans with an Energy Star rating have been reviewed by the U.S. Environmental Protection Agency and the U.S. Department of Energy. If they have received this rating you are assured they meet certain standards of energy efficiency with an eye towards reducing greenhouse gas emissions. These fans are generally more efficient than other fans with similar ratings. More tests have been performed on them, and manufacturers are proud to display this information. You will see CFM/CMS listed for each speed on all Energy Star qualified outdoor fans. All these fans also state the motor's efficiency ratings and watts per CFM/CMM so you can compare them with fans that aren't measured for CFM/CMM. The power of an outdoor fan may be described by Amps/Volts/Watts, "BTUs" or "Horsepower"
These are among the most helpful and universal measurements of an outdoor fan's power, and are supplied by almost all manufacturers. These ratings will also help you determine an outdoor fan's electrical efficiency, and will help you estimate electricity costs to run it. If a manufacturer only gives you BTU or horsepower, don't despair because you can figure out what that means in terms of watts. That way you'll have an equal basis for comparing all outdoor fans. A fan needs a certain amount of electricity to do its job. It draws that amount from the voltage supply of a power line, but the actual amount taken is called AMPERES or "AMPS". Bigger, stronger fans need more -- up to and over 10 amps. Smaller fans need less than 1 amp. They both draw electricity from the same voltage supply (e.g., 220 v), but they each draw a different amount of electricity from that supply. Fans that draw more than 20 amps won't work with standard household-type outlets. VOLTS are the measurement of electricity's "potential", or "pressure" that a power company supplies based on the kind of wiring to an outlet. 220V and 230V may be the most commonly used worldwide. The United States and much of Latin America uses either 110V or 220V, depending on the power of the fan and where it will be used. Most electrical power systems have slight variations in voltage due to demand or other factors. Generally, the difference of 10V or so makes no difference. But large variations in current can damage electrical equipment. In your outdoor fan's description or a label on the fan itself will be a statement such as 220VAC / 50Hz. This means the fan will run on 220 volts of alternating current and use 50 hertz of frequency. At the simplest level you can estimate an outdoor fan's power by how many watts it uses. Just like a light bulb. A 60-watt bulb uses less electricity and puts out less light than a 100-watt bulb. Try to imagine those 60 watts powering a fan. A 60-watt fan would use the same amount of electricity as a 60 watt bulb and be about as powerful. That's less electricity and power than a 100-watt fan and much less than a 560-watt fan. BTUs (British Thermal Units) are a common way to measure the cooling capacity of indoor air conditioners. Some fan manufacturers describe their outdoor fans in terms of BTUs even though fans use a very different technology than air conditioners. Remember fans only move the air; air conditioners also cool it. A more helpful and more available way to measure a fan's power is to look at its other ratings (watts, efficiency and CFM). HP (Horsepower) refers to the power of a motor. HP doesn't take into account the natural inefficiency of electric motors. HP doesn't take into account the voltage supply, either. An electric fan operating at, say 115 VAC (Volts of Alternating Current) will have a different horsepower than the very same fan operating at 220 VAC. A general rule is that 1 HP uses 10 amps on 110 volts; 1 HP uses 5 amps on 220 volts. Sure, they're both using the same amount of watts -- 1100 (remember amps × volts ≡ watts). But drawing more amps takes a bit more effort from the motor. If you have a fan with dual voltages, it will be a little easier on the motor to run it with the higher voltage, if possible. Even at that, not all horsepower ratings are measured the same. Some are rated under load (average amount of work long-term, "marathon"), some are rated at peak capacity (the most work they can do for a short time, "sprint"). Two two-horsepower motors may not be equal in actual power. Many small outdoor fans draw on lower voltages in the 100s range. Larger and more powerful fans need higher voltages in the 200s range to work correctly. Some fans -- called "dual voltage" fans -- can work on more than one voltage, usually with a switch to flip back and forth. These fans typically run better on higher voltages, especially if they need a long cord to reach the power supply. Of course any outdoor fan you buy should be able to work with your available power supply. Be sure to check a fan's CURRENT, FREQUENCY and VOLTAGE ratings. These will tell you before you purchase whether or not the fan is compatible with your power supply. You can learn more about these electrical terms and basic electrical concepts on our electricity basics page. AC current (Alternating Current) is the kind supplied by your local electric company. Fans that run on this AC current are the kind we're dealing with in this article. Fans that work on DC current (Direct Current), which usually comes from a battery, are discussed on the page we are developing for battery-powered outdoor cooling. HERTZ are the measurement of the electricity's FREQUENCY. Even if voltages are similar, a 60 hertz fan may not work with a 50 hertz frequency and vice versa. The frequency most used worldwide is 50 hertz. 60 hertz is used in about 20% of the countries including most of North, Central and South America. To learn more about other outdoor fans in general, visit outdoor fans. Learn more about fan blades here. Learn more about fan features here. Learn more about fan setup here. Visit our page on electrical safety outdoors.